Neoplasms of the lacrimal drainage system are uncommon, but potentially life-threatening and are often difficult to diagnose. Among primary lacrimal sac tumors, benign mixed tumors are extremely rare. Histologically, benign mixed tumors have been classified as a type of benign epithelial tumor. Here we report a case of benign mixed tumor of the lacrimal sac. Ophthalmologically, the benign mixed tumor is an extremely rare form of a primary lacrimal sac tumor that usually arises from the lacrimal gland. Here, we report a case of benign mixed tumor of the lacrimal sac. 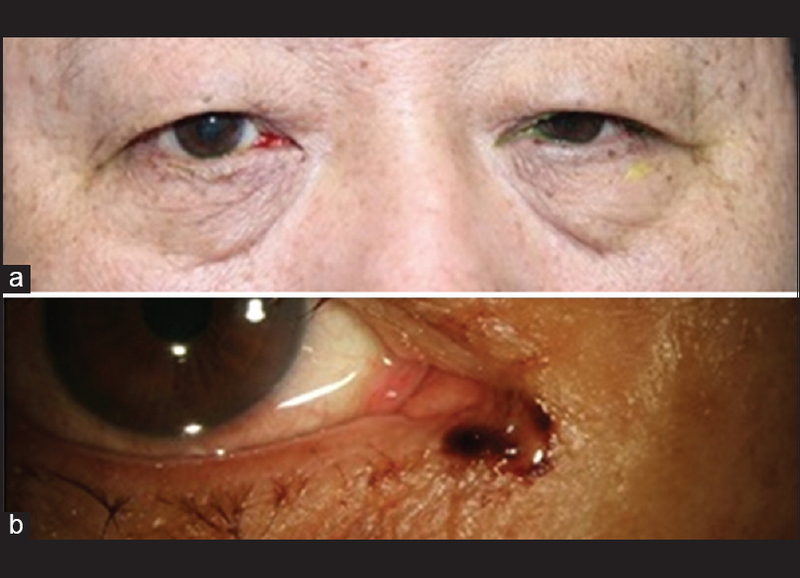 A 60-year-old male presented to the ophthalmology clinic with a 5-year history of epiphora and a 1-month history of bloody discharge from the right lower punctum. The patient did not complain of marked medial canthal swelling or tenderness. On examination, best corrected visual acuity was 20/20 bilaterally. 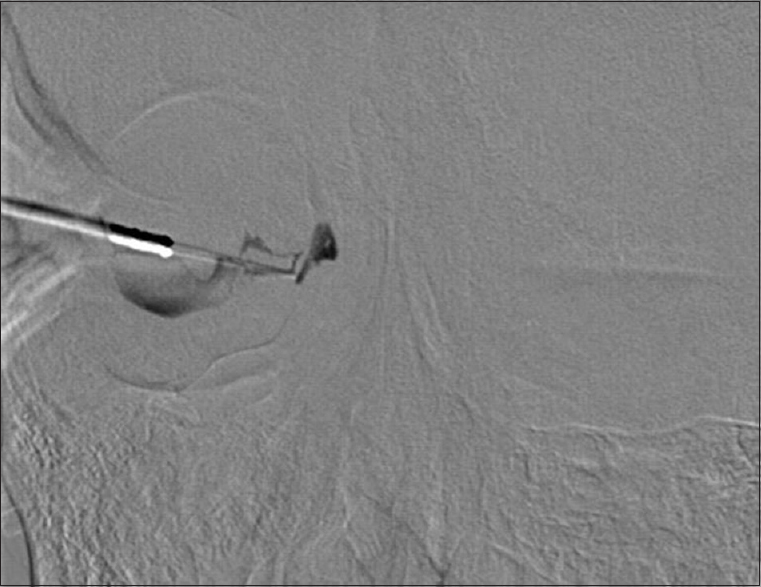 There was mucoid discharge with a blood clot found in the right lower punctum [Figure 1]a. Pressure over the lacrimal sacs produced bloody discharge, suggesting a primary lacrimal sac tumor [Figure 1]b. Syringing and dacryocystography demonstrated a complete obstruction at the level of the lacrimal sac [Figure 2]. Endoscopic endonasal examination was normal as were anterior segment and fundoscopic examinations. The patient then underwent a computed tomography (CT) scan which demonstrated a solid mass, measuring 1.2 cm × 1.2 cm × 1.6 cm, centered on the enlarged right lacrimal sac fossa [Figure 3]a. With high clinical suspicion of a tumor, the patient was advised to undergo an open DCR with excisional biopsy of the mass, lacrimal sac and the proximal portion of the nasolacrimal duct. A relatively well-circumscribed 1.2 cm × 1.2 cm × 1.6 cm solid mass [Figure 3]b was excised and sent for histological examination. The cutting plane was grossly white in color and had a negative resection margin. The specimen was subsequently evaluated for SMA, S-100, p63, CK5, CK6, and Alcian blue. The specimen was made up of variable patterns of epithelial and spindle cells in a hyalinized stroma with apocrine differentiation, similar to the histologic features of a pleomorphic adenoma of the lacrimal gland [Figure 4]. 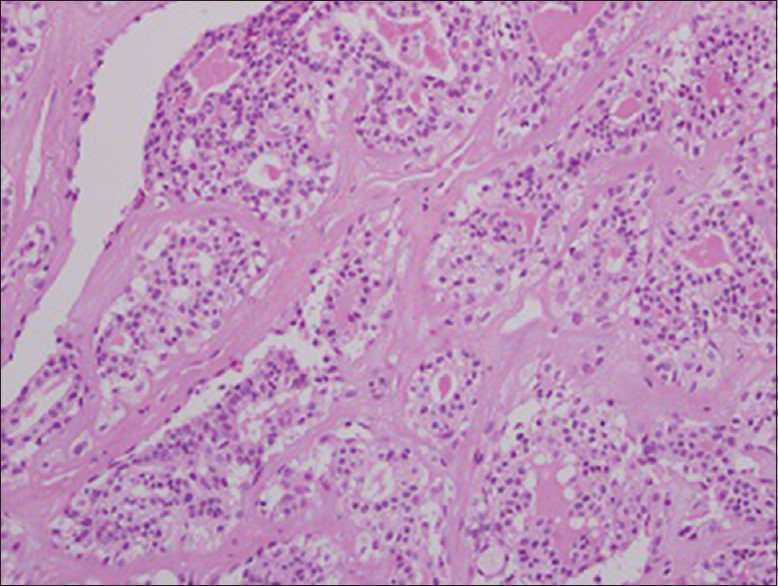 These histologic findings favored the diagnosis of a benign mixed tumor. One month after excision of the mass, the patient underwent a repeat CT, and no evidence of recurrence was found. The patient complained of epiphora in the right eye after surgery and underwent canaliculo-rhinostomy with silicone tube intubation. Our patient had a benign mixed tumor with no evidence of the other tumor foci or systemic spread. The patient underwent open DCR with excisional biopsy of the mass, lacrimal sac, and the proximal portion of the nasolacrimal duct and after 1-month, canaliculo-rhinostomy with silicone tube intubation for the treatment of epiphora. A repeat CT scan showed no evidence of tumor recurrence. 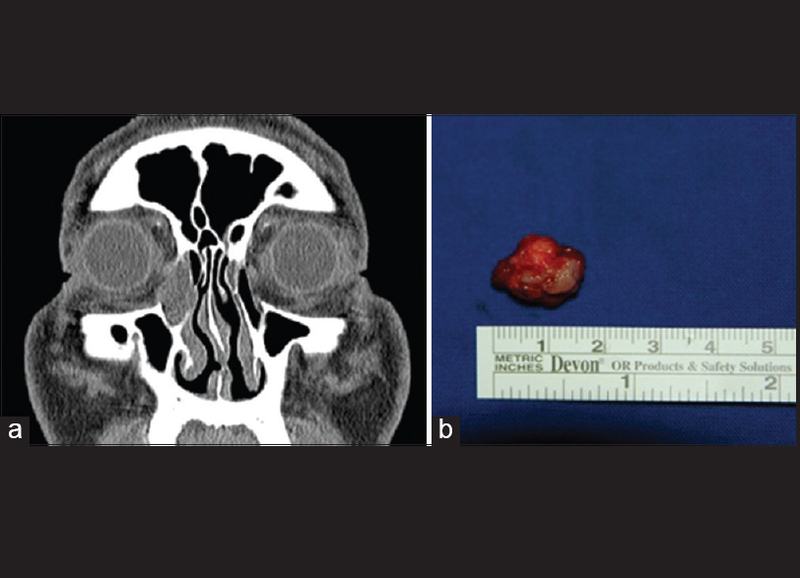 Although benign mixed tumors of the lacrimal sac are very uncommon, this case provides a rationale for including this condition in the differential diagnosis of lacrimal sac masses. Parmar DN, Rose GE. Management of lacrimal sac tumours. Eye (Lond) 2003;17:599-606. Ryan SJ, Font RL. Primary epithelial neoplasms of the lacrimal sac. Am J Ophthalmol 1973;76:73-88. Stefanyszyn MA, Hidayat AA, Pe'er JJ, Flanagan JC. Lacrimal sac tumors. Ophthal Plast Reconstr Surg 1994;10:169-84. Heindl LM, Jünemann AG, Kruse FE, Holbach LM. Tumors of the lacrimal drainage system. Orbit 2010;29:298-306. Pe'er J, Hidayat AA, Ilsar M, Landau L, Stefanyszyn MA. Glandular tumors of the lacrimal sac. Their histopathologic patterns and possible origins. Ophthalmology 1996;103:1601-5. Font RL. Eyelids and lacrimal drainage system. In: Spencer WH, editor. Ophthalmic Pathology. Vol. 4. Philadelphia: Saunders; 1996. p. 2412-27. Duke-Elder S. Tumors of the lacrimal passages. System of Ophthalmology. 5 th ed. St. Louis: CV Mosby; 1952. p. 5346-58. Baron S, Koka V, El Chater P, Cucherousset J, Paoli C. Pleomorphic adenoma of the nasal septum. Eur Ann Otorhinolaryngol Head Neck Dis 2014;131:139-41. Boboridis KG, Bunce C, Rose GE. Outcome of external dacryocystorhinostomy combined with membranectomy of a distal canalicular obstruction. Am J Ophthalmol 2005;139:1051-5. Emmerich KH, Busse H, Meyer-Rüsenberg HW. Dacryocystorhinostomia externa. Technique, indications and results. Ophthalmologe 1994;91:395-8.